(L-R) Calvin Chan, Roy Zuo, Jane Liang and Stephen Caffrey at a panel discussion held at GMIC. Treasure trove of data provides key to stem the tide of invalid traffic in China's ad industry. Invalid traffic (IVT), or non-human traffic, has been one of the insidious problems standing against efforts to fight ad fraud in China. How extensive is the problem? A white paper released by third-party verification agency AdMaster in March said that IVT accounted for 30.2 percent of all advertising traffic in China, with fraudulent traffic spiking from 22.3 percent of traffic in October to 38.7 percent in December. 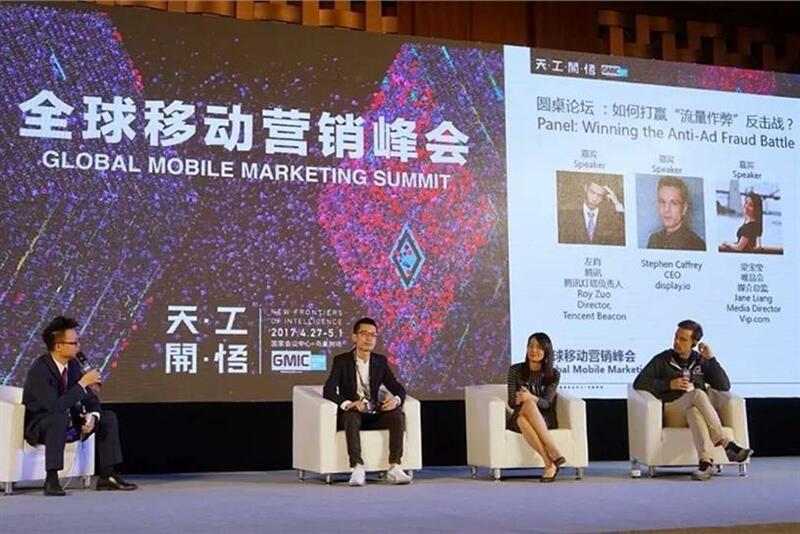 At the Global Mobile Internet Conference held in Beijing from April 27 through May 1, a number of players in the market, including Tencent, AdMaster, Miaozhen and Display.io discussed aspects of the issue ranging from getting a grip on the extent of the problem to potential solutions. "Whether we place the ads on online TV platforms or other specific sites, there are bound to be instances of fraud," said Jane Liang, media director of flash sales platform VIP.com. "And it doesn’t help that there is a lack of benchmark for us to evaluate the severity of the fraud. Often it is only after we have placed the ad that we realized how big of a problem it can lead to." Just as the digital landscape in China is developing at breakneck speed, fraudulent traffic has evolved. For example, Stephen Caffrey, co-founder and CEO of Display.io, said pre-clicking, which attributes organic app installs to publishers as paid installs, has been more common in the Chinese app market over the last two years. Analysis from his firm concludes that pre-clicking makes up 50 to 60 percent of fraud traffic, especially among android users, said Caffrey. While the fraudsters have upped their game with more sophisticated methods, ad-tech players are hot on their trail to enhance fraud detection by using data and machine learning. Tencent, which purportedly owns the most complete mobile ID user base in China through its Beacon unit, signed deal with AdMaster and with Miaozhen to create anti-fraud data lab that compiles "blacklists" of mobile device IDs and behavioral data. The collaboration marks the first time for both companies to work with Tencent to fight IVT. Speaking at the conference, Roy Zuo, director of Tencent Beacon, said although all the parties involved have different parameters for IVT, the combined data creates a bigger picture to help determine whether the viewer is human or a bot. He said voltage data from mobile phones, obtained via apps reporting back, could foretell fraud activities. "Phones that are used to generate false clicks are usually connected to the power source, so there wouldn’t be any drop in the phone’s power," Zuo said. "Furthermore, the geolocation would be the same as the phones would be left at the same location throughout the day. That could be useful indicators." However, Liang cautioned against relying solely on data and machine learning to detect fraud. "The machines may give us a lot of data but human evaluation is still needed for behavioral analysis, and each set of data should be judged on a case-by-case basis," said Liang. She pointed out that ad fraud could be less prevalent in programmatic direct buying (PDB) through an open exchange due to the technicality and high cost involved. "From the advertiser’s point of view, the volume of PDB is lower and less exposed to fraud. However, that doesn’t really solve our problem, as we usually deal with a huge volume of ads and not all buying is conducted through PDB," said Liang. Meanwhile, Ian Gao, head of programmatic ad serving and DMP at Miaozhen Systems, stressed that the collaboration with Tencent is at the pre-bid stage; data from the publisher would not necessarily confirm IVT. "As a third-party verification firm, we want to maintain our independence," he told Campaign Asia-Pacific. "We would not use data from just one publisher and conclude that the post-buy traffic is abnormal, that would be unfair to the other publishers. Our partnership with Tencent marks a good starting point. We hope to work with other big publishers in the future to get a more rounded analysis of the data." Due to the fragmented nature of the platforms available in China, Gao said the volume of the traffic is high but prevalently of a lower quality compared to western standards. Nevertheless, there is a rising awareness of ad fraud, and more brands are paying attention to the quality of the traffic. "IVT is among one of the concerns," he said. "The traffic can be genuine, but the ads are not served to the right platforms." Calvin Chan, COO of AdMaster, said addressing IVT is the first step towards achieving brand safety. "We don’t want the ads to be served on inappropriate channels, or not served at all, those are the problems that have not been properly fixed in the Chinese market," Chan told Campaign Asia-Pacific. He acknowledged that brand safety awareness is still relatively low, and it is not included in the firm’s product suite. "Of course the bigger international brands are concerned about brand safety, and they are looking for vendors who can help them with that," said Chan. "There are some clients who are more concerned about this issue, such as Japanese auto brands who do not want their ads to be served on anti-Japan sites, as well as those who want to screen out their competitors and fake product."